The next time you walk into someone’s office, take a look around. You generally see a lot of the same things: a desk, bookshelf, white board, trash can, maybe a filing cabinet and some paper trays. Depending on what they do, they have it set up a little differently to make their own personal work flow more efficiently. It’s exactly what we as technicians do with our toolboxes. We set them up how we need them, but the best part is that we have a lot more options. The basic set up isn’t rocket science; the size of your roll cabinet is determined by how many tools you have. You start small as a beginner and trade up into bigger boxes as your career and tool collection gain momentum. Regardless of where you start, organization is an important part of setting up your box and should be considered from the get-go. 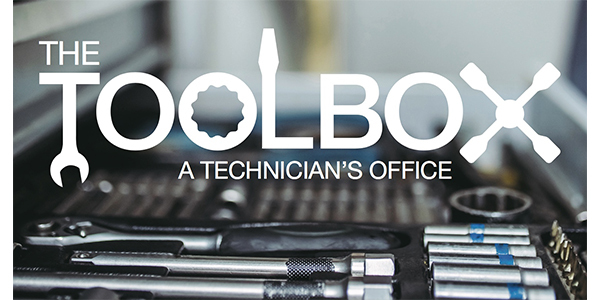 Here’s a list of some of our favorite toolbox features that have helped make technicians successful over the years. Optional roll cabinet work tops: Stainless steel and butcher block being the most common, these tops not only look good, but since they sit above the exposed lip on the front of the box, they are more comfortable when you need to lean across the front and they keep the paint on the lip from getting chipped up when tools land on it. Built-in power and USB outlets: These can be found as standard or optional in many different locations. Built into the front or tops of roll cabinets or built into work hutches and also some drawers, your own power source is a must have with computers and cordless tools dominating the repair landscape. Power tool organizer drawers and shelves: These are designed to keep cordless tools stored side-by- side, taking up the least amount of space possible. Side lockers: A great place to store blow-mold cases, available with or without drawers, lockers are also a great place to hang up your jacket. Mounting options allow you to hang lockers off a top chest, work hutch or even on the side of a roll cabinet. Work hutches: The perfect place to keep your laptop and paperwork, work hutches often have built-in lighting and outlets. They are especially convenient when you have to leave things you haven’t finished. No need to worry about anyone tampering with anything. Just lock it up and go at the end of a day. It’s also nice to have your own walls (on the inside) to decorate as you like. Top chests: The most efficient way to build real estate — go up instead of out. Locking pry bar racks: Keep those spacing-robbing giants out of your box while still keeping them protected. up each of your drawers with a dedicated spot for everything, and keep it all from sliding around. Foam kits: Outline, cut out and organize your tools with class. Some offerings include contrasting colors to show what’s missing at a glance. Be sure to set them up and include enough clearance to pick out tools easily. Color options: With so many choices, you can get your favorite — and customize with amazing graphics packages that are available. Can and bottle holders: Hanging on the side lip of your toolbox, these holders keep your aerosols organized and provide a place to keep a can of soda handy. Tool storage accessories: Wrench racks, socket holders, bit holders, there are countless options and they make the difference between neat and not. Magnetic tool silhouettes: When time is of the essence, there is nothing more frustrating than opening the wrong drawer. These tell you what is where at a glance. Toolbox cover: They keep dust and dirt from creeping into all the cracks and crevices over time. Take an extra minute to wipe your box down and cover it at the end of a productive day, you’ll be glad you did. So let your customers keep the stuffy room with off-white walls and a squeaky chair. Your of office is painted the way you like, has room for all the tools of your trade, moves where you want it to and you hold the key.